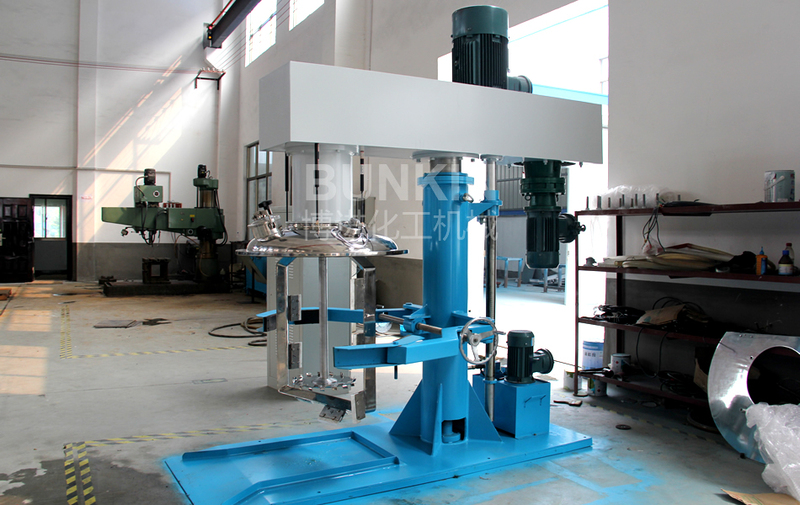 Concentric Dual Shaft Disperser_Anhui Bunkin Chemical Machinery Co.,LTD. 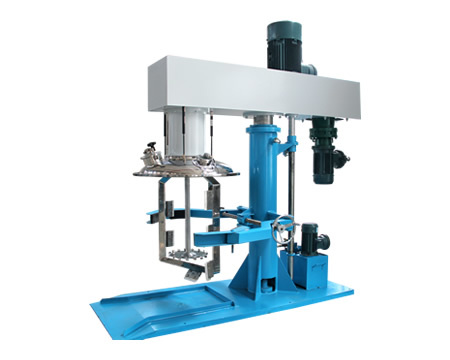 It is a new developed powerful dispersing and mixing machine based on hydraulic lifting single shaft mixer, it can be divided into dispensable dual shaft and coaxial dual shaft. It is especially suitable for mid-and-high viscosity material and thixotropic material, many agitator patterns for option, usually has anchor type, butterfly type, frame type etc., can disperse and mix at the same time, with strong adaptability, can be customized according to different property and production process of the material. Application Fields: Suitable for many kind of vicious liquid chemicals such as adhesives, pastes, inks, putty, glues etc. Mixing agitator driven by the power unit rotates in a fixed direction, which makes the materials rotate in axial and radial direction; And the materials inside the tank, at the same time, also do axial and circular motion.So materials can be mixed and blended property with high efficiency. The impeller is equipped with scraper clinging to the container wall to scrape the materials off the wall without residue the rotation of the impeller, which improve mixing effect significantly. Through the high speed rotation dispersing disc, the materials will become in annular form flow, resulting in strong vortex flow, which descend down to the bottom of the vortex in spiral state. During the process, materials are dispersed, dissolved, mixed and emulsified efficiently due to the strong shearing crash and friction among the particles. The dispersing disc produces a good radial power through the circular motion which accelerates the material circulation and improves the dispersion efficiency. PTFE scraper rotates clinging to the tank wall to scrape the materials staying on the tank wall off and also enhances the materials circulation. Adopt hydraulic cylinder as lifting actuators. Control the mixing up, stop, and down though controlling the valve, simple operation and high stability. With bolt fixing the agitator and the main shaft, easy to disassemble and clean, different clamping model (belt clamping, manual rotation clamping, pneumatic clamping) , can fix the mixing tank rapidly to prevent any possible accident due to tank displacement. Clean Discharging and Easy Maintenance There is scraper on the agitator, it clings to the container and scrape the materials on the wall off continuously. The container inner is precisely lathed and then mirror polished to ensure the scraper can scrape all materials sticking to the wall off without residue, improving effect.